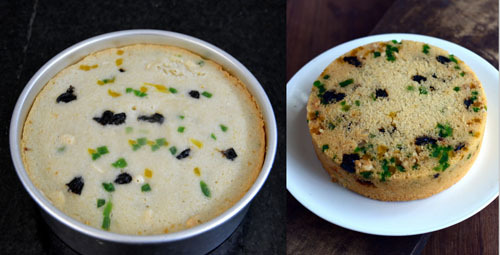 This is one of the simplest and easiest cake made with semolina and loads of nuts and dry fruits. The preparation time for this cake is not more than 10 minutes. Make this easy and quick cake for New Year and spend more time with your family and friends rather than in the kitchen. Today we will learn how to make Eggless Sweet Semolina cake following this easy recipe with step wise pictures. 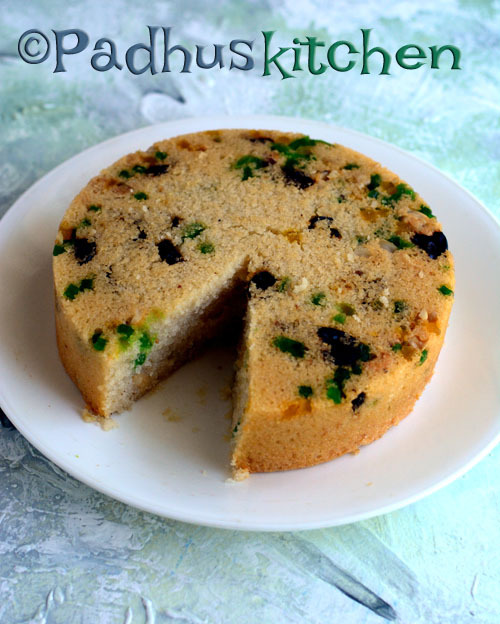 Use fine semolina for making this cake. If you cannot get fine rava/semolina, dry grind the regular rava for a few seconds in the mixie. Before baking, preheat the oven at 180 degree C for 10 minutes. Break cashew nuts into small pieces. Set aside. In a bowl, add rava, cardamom powder, powdered sugar, salt and mix well. Add any flavorless oil or ghee and mix well. Add beaten curd and mix well. Add milk, mix well and keep it covered. Let it sit for 30-40 minutes. The consistency of the batter should be that of idli batter consistency. If it is too tight, add a little more milk and mix well. Add baking soda, baking powder and mix until well combined. Add cashew nuts, tutti frutti, raisins (I used black ones) and fold gently. Grease a baking tin with oil or ghee. Scatter few nuts, raisins, tutti frutti into the baking tray and then pour the prepared batter. Tap the tin lightly for the batter to settle evenly. Sprinkle some tutti frutti, raisins and nuts on the top. Bake in a preheated oven at 180 degree C for 35 minutes or until a toothpick inserted in the center of the cake comes out clean. I turned on the upper coil for last few minutes for browning the top of the cake. Once done, remove it from the oven and leave it to cool. Then run a knife around the sides of the cake and invert it onto the plate. Cut the cake once it is completely cooled. Note - Do not prepare this cake without the tutti frutti, nuts and raisins as it is that which makes the cake special. Bake the cake immediately after adding baking soda and baking powder. You can make this cake in a cooker or any heavy bottomed vessel. Check my Vanilla cake in cooker for the method. You can also steam this cake. Check my banana steamed cake for the method. You can also microwave this cake. You can use any cup for measuring but use the same cup for measuring all ingredients. Wishing you a happy and healthy new year!! Wanted to know if you would microwave- for how long do we keep it? I tried the cake. It tasted nice. But the cake was very crumbly. Any advice to make it not crumbly? You might have over baked it slightly. Can we do this in cooker? Yes, you can bake in cooker. Follow the same method mentioned in my Vanilla cake in pressure cooker. Very interesting recipe. My mother uses butter (home made). But I liked yours as you have used oil. The taste was awesome but my cake didn't cook in the middle can you advise? You might have used a pan that's too small. Choose a slightly bigger baking tray/tin than you used. I have an OTG oven and I preheat for 10 minutes at 180 degree C before baking. I have not baked in microwave. In microwave also, you can preheat 10 mins before you keep the baking tray inside the oven.